Discover Leroux Creek Spa’s anti-aging secrets for yourself. Our products harness the revitalizing power of grape seed oil, proven to promote healthy, younger looking, more vibrant skin. Only the finest all-natural ingredients go into our products. Leroux Creek Spa products are made without parabens, alcohol, petro-chemicals, mineral oils or chemical preservatives. Leroux Creek Spa offers products for both men and women to meet their individual needs. 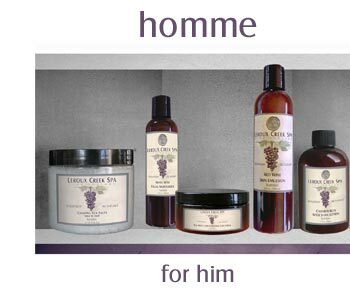 The Homme line addresses men’s increasing awareness of the benefits of healthy skin and contains Chamboucin red wine from our organic vineyard. 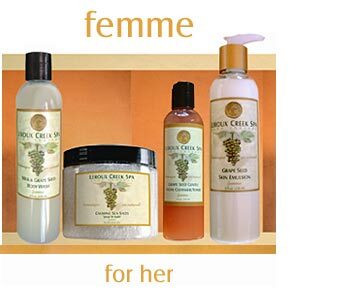 Femme products range from a gentle skin cleanser and toner, to a rich hydrating face crème. 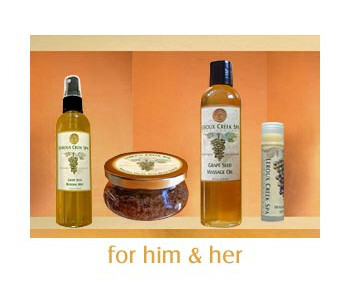 Men’s and women’s products include an amazing grape seed scrub, massage oil, lip balm and more. All products are formulated with natural preservatives and are made in small batches, ensuring freshness. Shop with confidence, and enjoy your purchases knowing you are doing something good for your skin!